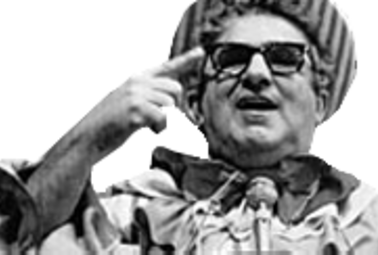 In the 60s, the presenter of auditorium TV shows Abelardo Barbosa, nicknamed Chacrinha, became one of the most popular figures on Brazilian TV. During the period, he presented two highly successful programs, Discoteca do Chacrinha (Chacrinha’s discotheque) and A Hora da Buzina (Time to blow the horn). Eccentric and ostentatious, with his clownish face and body, the antithesis of a TV star, the “old warrior” as he was also known, directed his programs within an environment of complete scenic freedom and in a carnival atmosphere. The talent contests and the shows by artists were marked by the racket in the auditorium which Chacrinha encouraged by flinging bananas and bits of salted cod whilst shouting his famous catch phrases “vocês querem bacalhau?” (“you want cod?”), “quem não comunica se trumbica” (“he who doesn’t communicate goes down the tubes”), “alô, alô, Terezinha” (“hello, hello, Terezinha”) and “alegria, alegria” (“joy, joy”), the latter used by Caetano Veloso as the title for his ultra-famous Tropicalist song. Chacrinha – “a mass Dadaist experience which sometimes appeared dangerous due to its being so absurd and so full of energy”, as Caetano said – attracted the attention of communication experts such as the French thinker Edgar Morin. Adopted by Tropicalism as a kid of pop symbol, Gilberto Gil paid him tribute in his farewell samba “Aquele Abraço” (“That Embrace”), before going into exile. Caetano Veloso appeared several times on the show, and Hélio Oiticica was a member of the talent contest jury.